The international community has condemned the conflict, however despite the severity of the situation and the high number of civilian deaths, it has only received a fraction of the attention it deserves. Worsened by corruption, unemployment, and food scarcity, it shows no sign of ending any time soon. 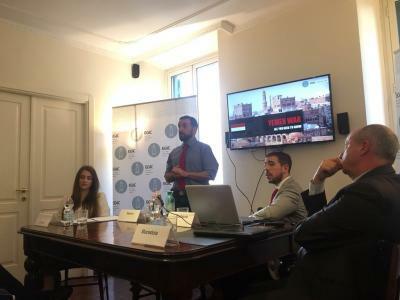 EGIC’s Analyst Antonino Occhiuto spoke first, offering a general overview of the conflict. The crisis originated in the handover of power from the former President Ali Abdullah Saleh to the current President Abdrabbuh Mansour Hadi in 2011, following a series of uprisings. Saleh, the only president of a "unified Yemen" to date, had pledged to help and support Hadi following his removal, however, he did not deliver on this promise. Two camps currently preside over Yemen, the Pro Hadi camp and the Houthi’s. The Pro Hadi camp is based in Aden and loyal to the current president Hadi. They are supported by a broad Arab coalition, made up of Saudi Arabia, Kuwait, the United Arab Emirates, Egypt, Bahrain, Jordan, and Kuwait. Despite receiving requests to end their support of the Saudi campaign, due to the high number of civilian casualties following the air strikes, the US Senate continue to back the coalition. Occhiuto suggested that the main motivation behind the United States' continued and consistent support of the coalition is to "avoid Yemen turning into a chaotic safe haven for terrorism and piracy." The Houthi’s are a Zaydi Shia Muslim military and political movement and loyal to the former president Saleh. The anti-Semitic and anti-imperialist group originated in northern Yemen and rose to prominence between 2003-5, with their ranks rapidly increasing and reaching approximately 100,000 by 2013, aided by Iranian financial backing and support. Their actions have been characterized by their quest to gain ground and further their control, most notably in 2014 when they took control of Yemen’s capital Sana’a which propelled Yemen into a spiral of political trauma. Occhiuto emphasized the importance of tribal allegiance in Yemen, as tribes offer a sense of belonging and security, and consequently direct political allegiance. Admiral Andrea Mucedola shed light on the war’s impact on maritime security and international piracy. He opened by commenting that maritime power is inextricably linked to a country's ability to maintain control. Mucedola focused on Piracy and Terrorism at sea, but was careful to clarify the difference between the two terms, highlighting their different objectives (ie ransom vs political) and their different characteristics. They are both key issues in the waters surrounding Yemen and have worsened significantly during the conflict. There is a huge black market, focused on weapons, drugs and human trafficking. Mucedola pointed out that maritime security is extremely hard to police effectively, due to the nature of the transport and movement at sea which makes it easy for pirates to coordinate their plans. Additionally, most cases of maritime piracy are not reported due to the inevitably expensive investigation that would ensue. With regards to possible prevention strategies, the Admiral commented that it is hard to deal with these issues given our democratic systems, however, risks can be minimized. He also stressed that one nation alone is not enough to combat the problems, and therefore the international community ought to all share the responsibility. He concluded by expressing his hope that those involved would "use their brains more than their weapons." Daniele Raineri, a journalist at Il Foglio, followed by focusing on the presence of the two Jihadi groups who have taken advantage of the dire conditions in Yemen and operate within the area; al-Qaeda in the Arabian Peninsula (AQAP) and the Islamic State (IS). Al Qaeda is older, larger and decidedly more established in Yemen. Raineri proposed that the main distinguishing factor between the two groups is that of how their operations are carried out. IS have readily accepted the risk of their actions on the Sunni people, despite them being in their constituency. Whereas AQAP have realized the importance of not alienating local populations, and when innocent civilians have suffered as a result of their actions in the past, they have issued apologies and offered money. The management techniques of the two Jihadi groups also differ greatly. When seizing new land, IS immediately declares it part of the caliphate whereas AQAP organizes a third party to control the land for them, under a different name and therefore distancing themselves from it. Raineri suggested that AQAP do this in an attempt to avoid the negative connotations of their own name and to present the situation in a better light for foreign media.